Originally meant as a unifying force for all Americans, the performance of “The Star-Spangled Banner” before sporting events has become increasingly divisive in recent years, exacerbated by the actions and reactions in the National Football League. But that’s another issue that can be debated elsewhere. After the 1814 poem “Defence of Fort McHenry” was written and set to music, “The Star-Spangled Banner” became a patriotic tune along with others like, “Hail Columbia”, “Yankee Doodle”, “My Country ‘Tis of Thee”, “Chester”, “Red White and Blue” (Columbia Gem of the Ocean), “The Battle Cry of Freedom”, and “The Battle Hymn of the Republic.” By the end of the Civil War, “The Star-Spangled Banner” had surpassed other tunes (“America The Beautiful” and “God Bless America” were still in the future) to become recognized as our unofficial national anthem. The two competing tunes in the latter part of the 19th century were “Hail Columbia” and “The Star Spangled Banner.” American composer and bandmaster John Philip Sousa, who performed the piece on concerts, aided the popularity of “The Star-Spangled Banner.” Although Sousa had first endorsed “Hail Columbia” as the tune that should be recognized as the national anthem he came to support the adoption of “The Star-Spangled Banner.” Things were pretty much settled by the U.S. government. In 1889, Secretary of the Navy Benjamin F. Tracy signed an order directing that “The Star-Spangled Banner” be the official song to accompany any raising of the American flag by the Navy and “Hail Columbia” be played as the flag was lowered in the evening. 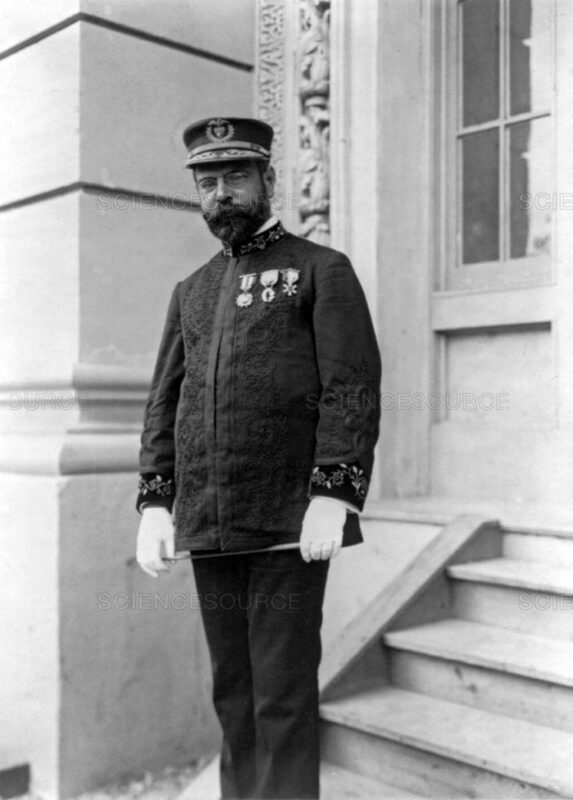 Sousa would play the “The Star-Spangled Banner” on tour with his band after he left the US Marine Band in 1892, even performing it as an encore selection for King Edward VII during a command performance at Sandringham Castle in England. He would go on to play “The Star-Spangled Banner” on tour around the world to audiences who would stand during its rendition. To much of the world, thanks to Sousa, it was our national anthem. In 1916, President Woodrow Wilson signed an executive order designating it as the country’s national anthem for patriotic occasions. But that status didn’t become truly official until 1931 when Congress passed a measure that President Herbert Hoover signed into law. Sousa played a crucial part in the adoption of “The Star-Spangled Banner” as our national anthem by promoting it and offering his opinion on the music. He lived to see it become our national anthem, passing away almost a year to the day after it was signed into law. 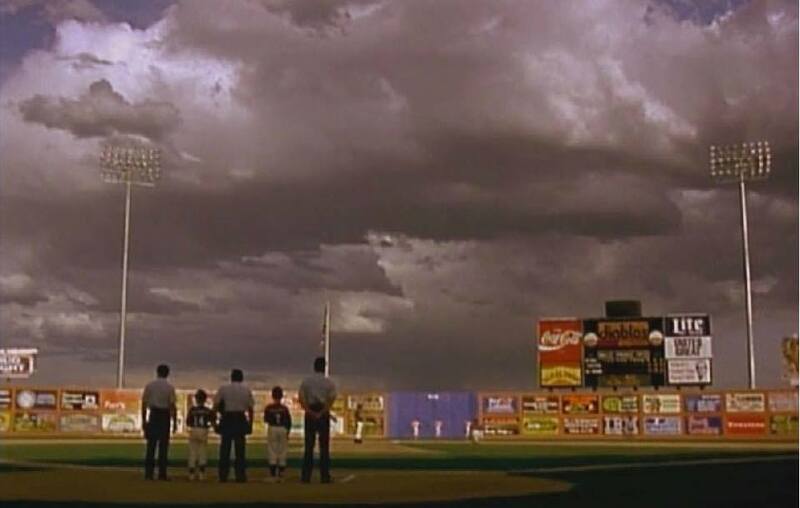 The earliest documented performance of “The Star-Spangled Banner” at a baseball game took place at the Union Baseball and Cricket Grounds in Brooklyn, New York on May 15, 1862. This was the first opening day since the Civil War had interrupted the start of the baseball season one year earlier. 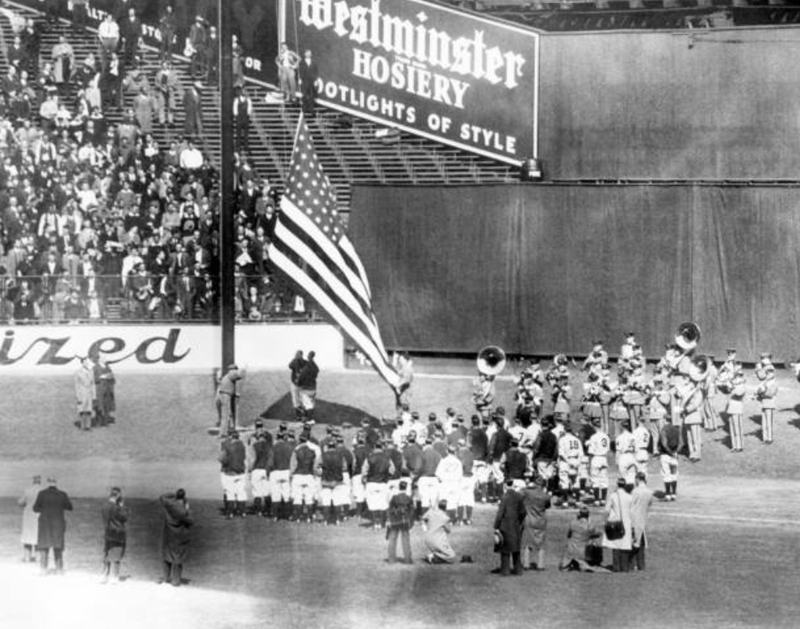 It was the park’s opening game and over time the playing of “The Star-Spangled Banner”, along with other popular patriotic tunes, on the opening day of the baseball season became a more widespread practice. But the performance of “The Star-Spangled Banner” before every game did not become commonplace until later. This brings us up to September 5, 1918 and the first game of a World Series that almost didn’t happen. 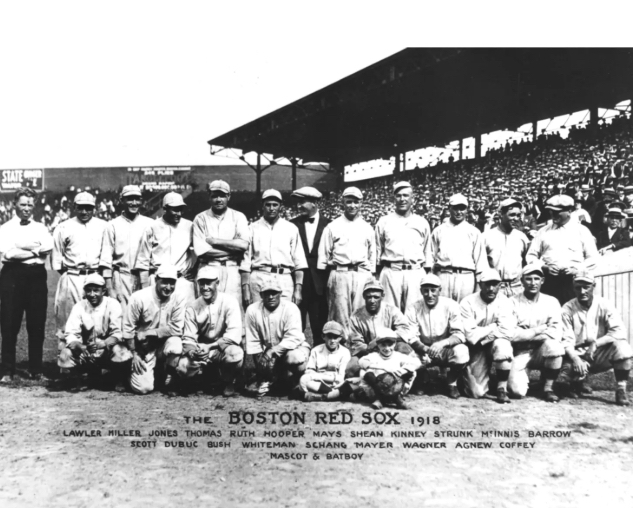 The 1918 baseball season was reduced to 140 games due to World War I. Baseball owners were reluctant to make cutbacks but reduced travel, relocated training sites closer, and trimmed player salaries. Many minor leagues closed down in 1917 and the major league started losing players to enlistments, the draft, and work in war-related factories. Teams tried to show their support by having players participate in pre-game military “drill” sessions using their bats as props for guns. The 1918 season was to be played under a cloud of suspicion from many who thought the game shouldn’t be exempt from the war effort. On July 1, 1918, Secretary of War Newton D. Baker issued a “work or fight” order, stating that all draft-eligible men who worked in “non-essential” vocations must sign up for war-related work or risk being drafted for battle. Baseball was given a temporary pass, as government officials declined to recognize it as one of the “non-essential” activities. 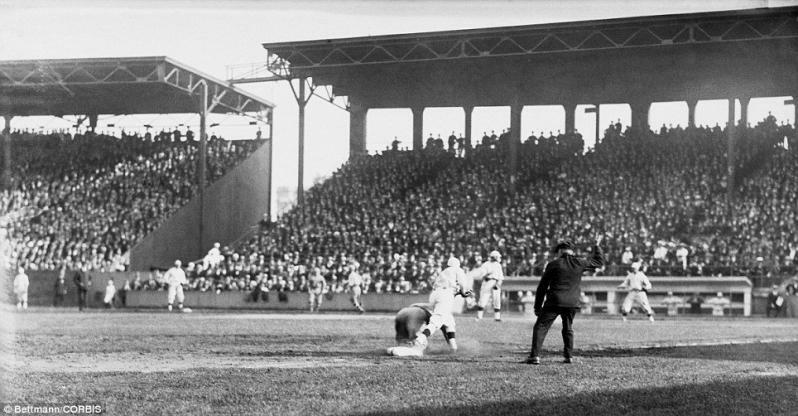 The first game of the series was held at Comisky Park in Chicago with Babe Ruth starting on the mound for Boston. As with major events a band had been hired to play music for pre-game and during the inning changes. Bands (mostly brass and percussion with woodwinds) played marches and popular tunes for the enjoyment of fans in the era before sound systems. During the seventh inning the crowd rose to stretch their legs into what was to become a tradition in baseball. Where and when the ritual of standing during the seventh inning began is unclear. Some claim it was started by William Howard Taft, the 27th President. Taft, at 300 pounds, was the largest man to hold the office. On the opening day of the 1910 season Taft became the first president to throw out the first pitch. After sitting in a small chair for seven innings he stood up to stretch his aching legs. Thinking the president was about to leave, the crowd rose to show their respect. A few minutes later Taft returned to his seat, the crowd followed suit, and the “seventh-inning stretch” was born. Although claims for the origin of the seventh-inning stretch are made by the Manhattan College in an 1882 game, it turns out a manuscript dated 1869 was found documenting what could only be described as a seventh-inning stretch. It’s a letter written by Harry Wright of the Cincinnati Red Stockings, the first pro baseball team. In it, he makes the following observation about the fans’ ballpark behavior: “The spectators all arise between halves of the seventh inning, extend their legs and arms and sometimes walk about. In so doing they enjoy the relief afforded by relaxation from a long posture upon hard benches.” A tradition was born. 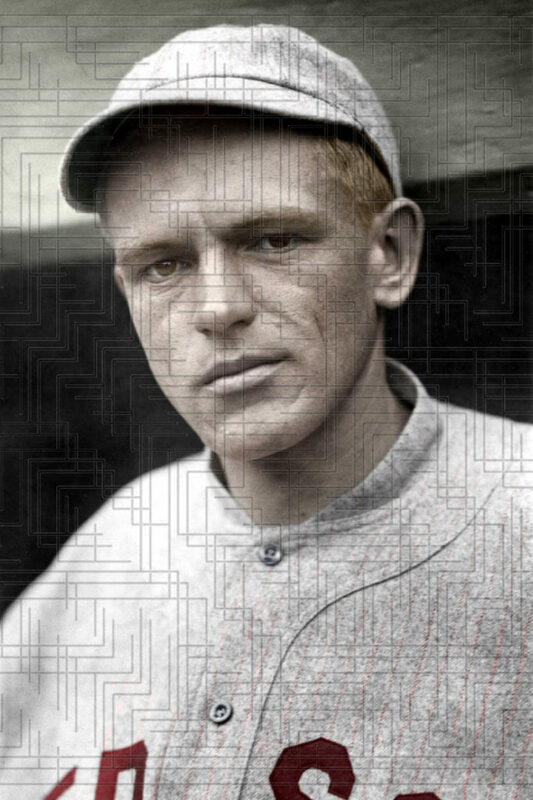 Fred Thomas had been granted furlough from the Navy to play in the World Series and was aware of the regulations to salute the flag during the playing of the song. However, while the Times referred to the song as the national anthem, that was not technically the case yet. That would not for another 13 years. 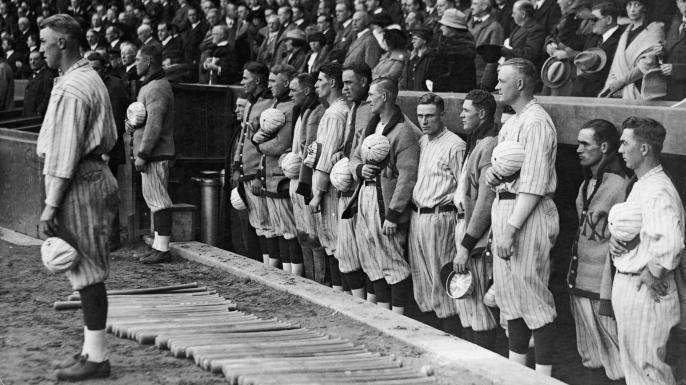 “The outpouring of sentiment, enthusiasm, and patriotism at the 1918 World Series went a long way to making the (song) the national anthem,’’ John Thorn, Major League Baseball’s official historian, told the Associated Press in an interview. What gave the bandleader that day the idea to play the song we may never know. 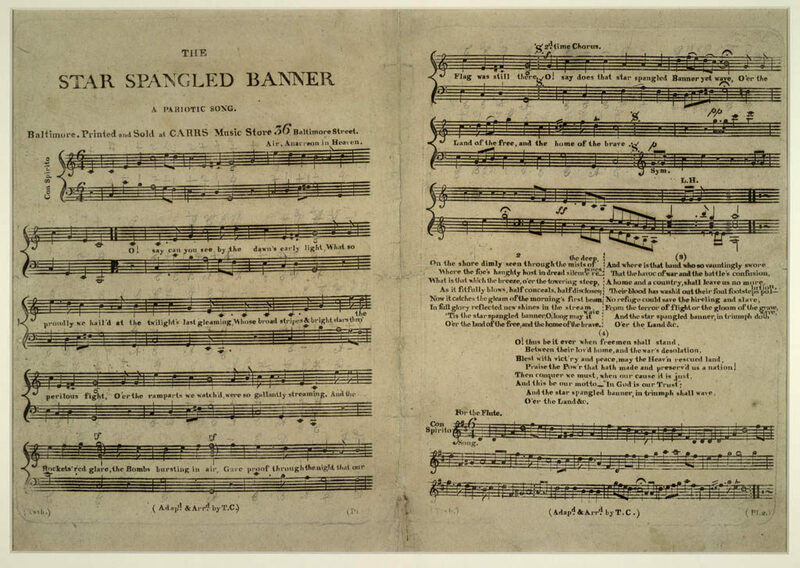 However “The Star-Spangled Banner” was one of many patriotic tunes performed by bands and although “Take Me Out to the Ballgame” was 10 years old at the time, it was not a song played or sung at games. “The Star-Spangled Banner” would be played at each of the Series’ remaining games, to increasingly rapturous response. Patriotism was to play a large part of the series as the Red Sox gave free tickets to wounded veterans and honored them during the playing of the song before the start of Game 6. Other baseball parks began to play the song on holidays and special occasions, and Red Sox owner Harry Frazee made it a regular part of Boston home games. “The Star-Spangled Banner” officially became the U.S. national anthem in 1931, and during World War II it was played at the start of virtually ever baseball game aided by sound systems. The practice spread to football games during World War II and at end off the war National Football League Commissioner Elmer Layden ordered that it be played at every game saying “The playing of the national anthem should be as much a part of every game as the kickoff. We must not drop it simply because the war is over.” The tradition quickly spread to other sports, aided by the introduction of large sound systems and post-war patriotism. So by accident or a sudden patriotic gesture “The Star-Spangled Banner” became an integral part of the national pastime. This entry was posted on Tuesday, September 4th, 2018 at 9:00 am	and is filed under Bugle Stories, General Interest, Jari's Articles, News, Uncategorized. You can follow any responses to this entry through the RSS 2.0 feed. You can leave a response, or trackback from your own site.